Presente gratuito para os atendentes do V CBEC Congresso Internacional de Compras! CONGRATULATIONS! 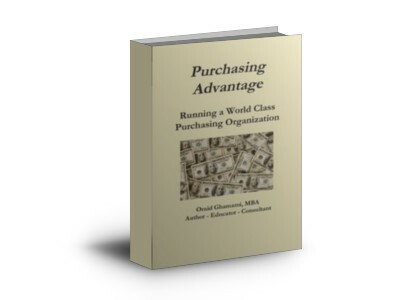 As an attendee of the CBEC International Purchasing Congress, you qualify for this limited time, FREE Gift of Omid Ghamami’s highly acclaimed book, “Running a World Class Purchasing Organization”! In it, you’ll learn what took Omid 18 years to develop and perfect to produce a paradigm shift in the way Purchasing is done while working at Intel Corporation, and why Intel named him, “THE Godfather of Negotiation Planning”. Omid spent 18 years at Intel Corporation, working his way up to running the entire global purchasing operations organization, with $2.2 Billion in total scope and responsibility! This book is intended to give an overview of the highly critical corporate skill of knowing how to run a world class purchasing organization. It is not meant to be read once and then put aside, as one might do with a novel. It is meant to be read once, with certain sections referenced on an ongoing basis as the need arises. There are several topics that are avoided altogether (enterprise system selection, integration, and management, for example), or just lightly addressed (purchasing organizational structure, for example). This was a conscious decision to focus this book on the categories that were deemed of greater priority, with the materials culminating in a series of negotiation strategies that have been proven to help in reducing total cost and improving supplier relations when utilized correctly. Grab your FREE copy of this book by entering your information in the form on the right side of this page. You’ll automatically get instructions how you can download the PDF copy of the book, which regularly sells for $39.99. Our Gift to you! For more in depth and hands on coverage of any particular section of this book, I offer corporate training and consulting services, as referenced in the back cover of this book. Enjoy! Copyright © Omid Ghamimi. All rights reserved.